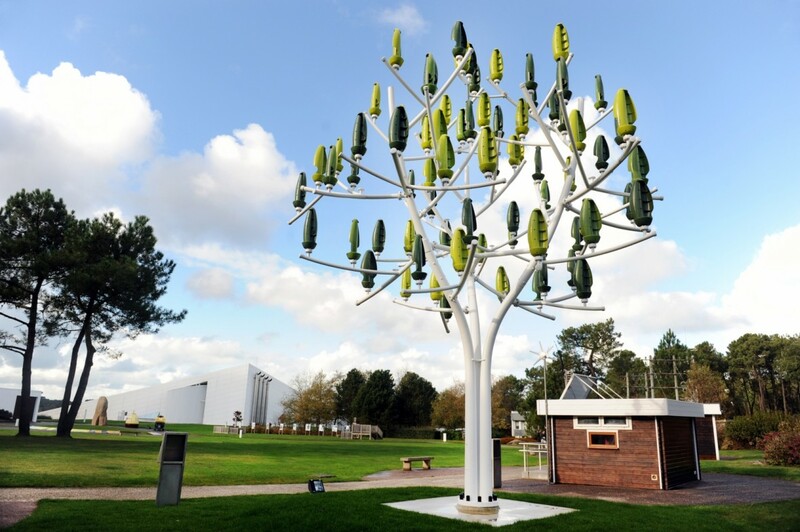 Jerome Michaud-Lariviere has invented The Wind Tree, a windmill that looks like a tree. Made of metal, it has 72 fake leaves that are actually turbines, and looks like a piece of art. The most significant part: the new kind of turbine is silent and much smaller than the typical ones—8 metres tall instead of more than 60 metres tall. It has a capacity of up to 3.1 kilowatts, which is low compared to traditional models. It can also be attached to a building’s power system. Wind turbines create electricity by converting the wind’s kinetic energy into mechanical power. They can be built near oceans and lakes or on land and are often put into a group called wind farms. One of the turbines is currently in a town in northwestern France and another will be displayed in Paris in May 2015. The public will be able to buy the turbines from the company, New Wind, beginning in May 2015 as well. Michaud-Lariviere hopes that his Wind Tree can provide power to charge electric cars or LED street lights. The Wind Tree, by contrast, definitely would not be a nightmare neighbour. It is not designed to replace traditional wind turbines, but could be an attractive option for cities where space is limited.